Monday is our annual United Way cake auction at work. Being a baker, I always contribute something. I stay away from trying to snag the best decorated cake because, as I've mentioned before, I prefer cake to frosting, quality vs looks. I might not get the recognition in the building by getting a prize, but I have the pride of knowing that my cake stands up against all the rest for being a delicious, high quality contribution. This time around I wanted to do something different. But these days it is hard to find an unusual cake, something that people haven't had before. I wanted my typical, high quality, but without having to get ultra-gourmet with three days of baking/assembly and a zillion steps. 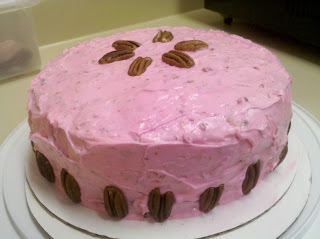 I found what I wanted in a Hummingbird Cake. The Hummingbird Cake became well known after it first appeared in Southern Living magazine in 1978. There are a couple of theories to its name. One says that the sweetness of the cake reminds one of the nectar the hummingbirds feed on. Another says that it comes from the humming "mmmmmms" coming from people after they take a bite. Either way, the cake is delicious and easy to make. The ingredient combination might sound a bit odd: bananas, pineapple, pecans. Blended together they make a cakey, fruity sort of banana bread that's covered with a cream cheese frosting. It's easy in that you mix the wet ingredients in one bowl, the dry in another, and then combine. I used the recipe from the Martha Stewart website. I chose pink since October is breast cancer awareness month. How was it received? I don't know. I had to deliver the cake and take the day off to go work on my mortgage. But I had made a small cupcake size on the side so I could taste it. It was dense and nutty. I couldn't taste the banana and pineapple, but know that they added to the taste and the density. It's a cake I will make again. Preheat oven to 325 degrees. Spray and flour three 8-by-2-inch round cake pans, tapping out excess flour; set aside. Prepare the cake; in a large bowl, stir to combine self-rising flour, sugar, oil, pecans, bananas, pineapple, vanilla, cinnamon, and eggs. Prepare the frosting; in the bowl of an electric mixer fitted with the paddle attachment, combine sugar, cream cheese, butter, vanilla, and 1 tablespoon milk on medium speed until frosting is smooth. If needed, add more milk, 1 teaspoon at a time, to achieve the proper spreading consistency. Using a serrated knife, trim tops of cakes to make level. Place four strips of parchment paper around perimeter of a serving plate or lazy Susan. Place the first layer on the cake plate. Spread the top of the first layer with 1/4 of the frosting. Place the second layer on top and repeat process with another 1/4 of the frosting. Place the remaining layer on top of the second layer bottom side up. Spread entire cake with remaining frosting. Sprinkle the top with pecans. Remove parchment paper strips; refrigerate until ready to serve.